Russell Pacific Construction Services (RPCS), a partner of Array Technologies (ATI Solar Energy), provides complete turnkey project design and mechanical installation services for solar tracking. 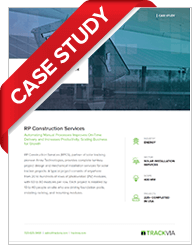 RPCS identified that their manual processes were impacting the success of their overall business. They sought to automate these processes with applications that could address their unique business cases and investigated several solutions. So, what was their evaluation and decision making process for a solution to meet their needs? Read this RPCS presentation and hear it directly from the source.